South Africa has a number of World Heritage sites. In Cape Town it is our floral kingdom where there are more species of plants than in the whole of the British Isles. Anybody visiting Cape Town and touring the Cape Peninsula will be shown some of the flowers en route. 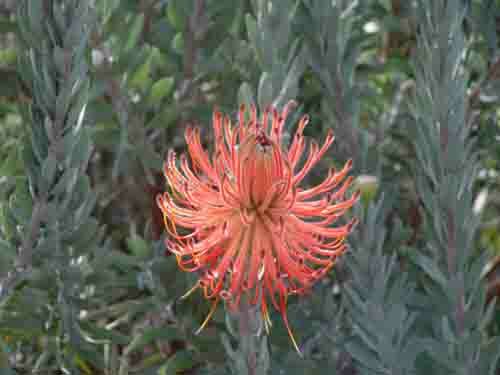 The main species are the Erica, the proteas and the restios or reeds. Kirstenbosch Botanical gardens houses many of these plants so a visit there at any season will always produce a flower show for you. Winter is a good time to visit as many of the protea varieties are in flower. Robben Island is the Cape's second World heritage site. Not only has the island been a penal colony and a leper colony. it has also been the prison home of South Africa's most revered leader Nelson Mandela. The island also has a colony of sea birds which include gannets and penguins. It is also interesting that Robben Island was the site of the first lighthouse in the Cape which was established by Jan van Riebeeck to stop ships arriving in Table Bay at night from running aground on it. The next three sites are found in the north east of South Africa in what used to be the old Transvaal. The first is the Vredefort Dome , which is the oldest and largest meteorite impact site (Asrobleme) in the world. It was formed an estimated 2000 million years ago when a gigantic meteorite (asteroid) hit the earth close to where Vredefort is today. The force of the impact opened up a crater, which is still visible, and is about 40km in diameter. The second site is the Mapungupwe site which which existed between 1200 and 1300AD and is said to be the centre of the largest kingdom in the subcontinent where a highly sophisticated people traded gold and ivory with countries such as China, India and Egypt. The place of the stone of wisdom. At the confluence of the Shashi and Limpopo rivers in the Messina district in what used to be the Northern Transvaal now Limpopo province, are two hills separated by a valley. The hills named Bambandyanalo and Mapungubwe are situated on a farm named Greefswald. These hills were being prospected by a man named van Graan way back in 1932 when he discovered that the Mapungubwe Hill was littered with pottery. The find interested him and on closer inpection and digging he found two kilograms of pure gold foil together with beads and ornaments. Van Graan decided to keep this find to himself but later changed his mind and reported it to the University of Pretoria. They started their excavations on the site in 1932 but as the evidence gathered showed that there was a complex society in Southern Africa before colonisation of the Dutch began in the 1600's it was decided to keep the existence of the site secret. At the time the findings of the University provided evidence which was at loggerheads with the ideology of black inferiority that formed the cornerstone of the apartheid government policy. It was also found that the site was the root of the origins of Zimbabwean culture and that Mapungubwe was the centre of the largest kingdom in the subcontinent, where a highly sophisticated people traded gold and ivory with China, India and Egypt. Over the years of excavating the site the University of Pretoria has gathered a rich collection of artefacts made of gold and other materials and human remains. Excavations have revealed a court sheltered in a natural amphitheatre at the bottom of the Mapungupwe hill and an elite graveyard at the top. So far twenty-three graves have been excavated. The bodies in three of the graves discovered were buried in the upright seated position which is associated with royalty. Found with the bodies were a variety of gold and copper items, exotic glass beads, and other prestigious objects providing evidence of the early working of gold in Southern Africa. Amongst the ornaments in one of the graves was a pure gold foil artifact of a rhinocerous made of wood with the gold foil tacked onto it. Over the years the wood had disintegrated but the artifact had kept its shape. What has also been deduced from evidence gathered is that the Mapungubwe region was the centre of trade in Southern Africa. between 1200 and 1300 AD. Its wealth came from the trade in ivory and from gold deposits that were found in Zimbabwe. Due to large scale flooding by Shashi and Limpopo rivers the area was also agriculturally rich. As in all societies the wealth in the area produced rich people and vast differences between rich and poor. Archaeologists have also discovered a neighbouring village named K2 where an ancient rubbish dump has provided information on the lifestyles of the people who lived in Mapungupwe. Evidence shows that the people kept cattle, sheep, goats and dogs and that millet, sorghum and cotton were cultivated. Other findings reveal that the people were able to work iron and gold and that they made items of copper, iron and gold which were traded with cultures from as far away as East Africa, Persia, Egypt, India and China. Unfortunately the glory of Mapungupwe lasted only a 100 years from 1200 AD to 1300 AD when it ended. There are various theories as to the reason why. The most popular appears to be as a result of climate changes that made the area colder and drier. A second theory is that a change in trade routes led to a shift in trade to Great Zimbabwe where another civilised culture existed. Since the change of Government in South Africa in 1994 the Mapangupwe site has come into prominence. It has been declared a World Heritage Site by the United Nations Educational, Scientific and Cultural Organisation (Unesco). South Africa a total of seven of these sites - three cultural, three natural and one mixed. South Africa's World Heritage sites are Robben Island, the Vredefort Dome, the Cradle of Humankind, the uKhahlamba Drakensburg Park, the Greater St Lucia Wetlands Park and the Cape Floral Region. Mapungupwe was added to the World Heritage List in July 2003. Next time you visit South Africa include some of these sites in your itinerary. The third is the Cradle of mankind or Sterkfontein caves. These caves are one of the world's most productive and important palaeoanthropological sites and the place where the very first adult ape-man was found in 1936. Fossils dating from about 3.5 to 1.5 million years ago, representing the early development of the family of man-the hominids have been found there. Also found there were skulls, jaws, teeth and skeletal fossils of these early hominids. There are also many thousands of animal fossils, more than 300 fragments of fossil woods and 9,000 stone tools which include some of the earliest human cultures on earth. The uKhahlamba – Drakensberg Park found in Kwa Zulu Natal is an area of exceptional natural beauty with its soaring buttresses and golden sandstone ramparts. Its high altitude grasslands and pristine river valleys and rocky gorges enhance the beauty of the area. The site has a diversity of habitats which protect many endemic and globally threatened species such as birds and plants. They were painted by the San people over a period of 4,000 years and depict animals and human beings and are said to picture the spiratual life of the San peoples who once lived in the caves. Greater St. Lucia Wetland Park World Heritage Siteis situated about 300km north of Durban . In the wetlands you will find four of the Big Five wild animals to be seen in South Africa. There are plenty of activities to be undertaken at this site. The turtle breading season starts in October and carries on till April of the next year. Whale watching is from June till December. Other activities such as fishing, hippo cruises, walking trails and night safaris plus many others are on offer for visitors to this region. This is one site that should not be missed if you intend visiting South Africa. South Africa is blessed with exceptional beauty, riches and friendly people. Why not visit us and some of the sites highlighted when you next take a vacation.